All Your Christmas Cards Come at Once! It’s mid-September and that means it’s time to start thinking about Christmas cards. Too soon? Why no, my organised friends! Remember that year you left it too late and had to purchase those awful generic ones with cheap envelopes and threw a company sticker on the back and left it at that. Yep… you remember how dirty that made you feel. So, it’s time to get started. Corporate Christmas cards are a fabulous, human way to touch base with your database. An actual card makes a much more unique and emotional impression than a MailChimp special, especially when there has been some clever design thinking and playful branding incorporated into the cards. Last year, Peter D’Andreti of Dandreti Design created these gorgeous Christmas tags, cleverly mixing colours to get 6 or more shades out 3 PMS colours. We had a go ourselves (look at the picture here) creating our cards as tags with retro Christmas shapes just using vector artwork we purchased cheaply from iStockphoto. The tags doubled as Christmas tree decorations. Vintage designs like snowflakes or holly are timeless, and if you have elements that you would like some help putting together, Watermarx is at your service. We can help typeset and layout your ideas. If you’re thinking letterpress for your Christmas cards (and you should be!) then it’s usually a 2 or 3 colour job. But take note of Peter’s card and see how far you can stretch those few colours. Adorable dad jokes, sweet puns and eye-rolling goofiness makes for a memorable card that suits the child-like fun of the silly season. Clever copy paired with something as elegant as a simple deboss or emboss means the words will linger in the mind, and the card will linger in the hand. Show off your clever creativity by doing more with your card. Doubling as a decoration means your card might not be relegated to the recycling bin quite as quickly as others. Try pop-out decorations or a hole punched through the top with festive ribbon to see your logo dangling from clients’ trees and in their minds for New Year projects. 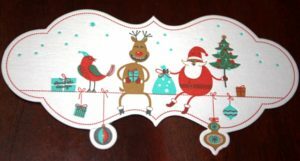 Christmas coasters on beermat board: this idea is memorable and goes well with gifts of alcohol. Letterpressed envelopes: this is just so classy. Recycled stock: for a lo-fi, environmental feel. Foiled deboss: because everyone likes a bit of tinsel. Letterpressed photos: just ask us about this new technique. Pop-up Cards: always wanted to design a pop-up book. Get your fix this way! Remember to send your cards out early! Your clients and friends can actually enjoy them and they will stay on display for longer, that way, you get your money’s worth. As a bonus you might even find yourself invited to a few more office Christmas parties! Our friend, Paul Nolan, was in town last week and popped by our factory in Brookvale to say hello. We got to know Paul when he won the competition we ran last year to launch our new website, and we printed the business cards he designed. Apart from being a very talented typographer, Paul has recently launched a new printing venture with his brother, in Brisbane. The Picky Meshman is a celebration of Paul’s (“Picky”) obsession with serigraphy, otherwise known as screen printing, a process that involves the transfer of an image through a mesh screen using stencils to block out the desired image or pattern. 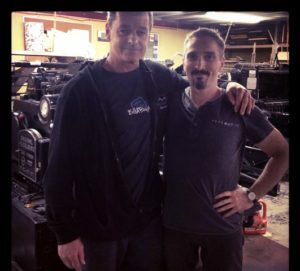 He believes that screen-printing is an incredibly flexible way to print but the number of high-quality screen printers has dwindled drastically. Paul’s enthusiasm for the business is infectious and they are already doing some pretty amazing work. He and his brother, Arty, have dubbed themselves “champions of the dead art” and we’re pleased to hear it. Any die-hard fan of ink and paper, is a firm friend of ours.